Palace Theatre, Manchester | Flickr - Photo Sharing! I have seen Les Miserables, seven times, so I did not make it eight this time round. 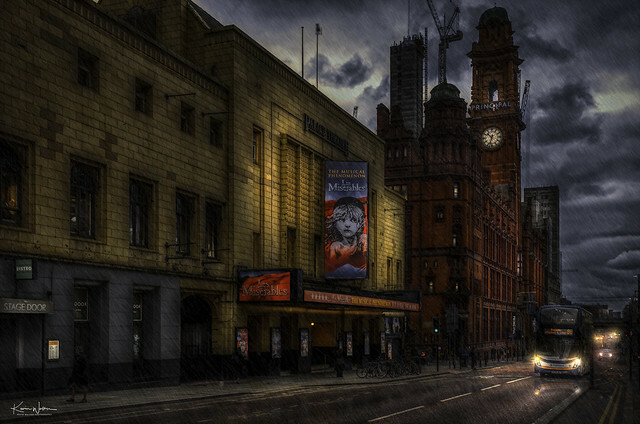 The Palace Theatre, Manchester, is one of the main theatres in Manchester, England. It is situated on Oxford Street, on the north-east corner of the intersection with Whitworth Street. The Palace and its sister theatre the Opera House on Quay Street are operated by the same parent company, Ambassador Theatre Group. WilliamND4, DAVIDNICHOLAS29, and 333 other people added this photo to their favorites. beautiful photograph,lovely light effectsxxxxxxnever seen the musical mis les,only seen an old film of it.was going to read the book ,but never did!!! I too have seen Les Mis, multiple times...but the best of all was years ago on the London stage. Thanks for the reminder with this excellent image! beautiful work as usually Bravo! !